There are so many things that can be said about Space Battleship Yamato 2199 (Uchuu Senkan Yamato 2199) that it is a mostly convenient thing for me that the production committee has decided to spread the story in 26-episode-long anime and seven movies. 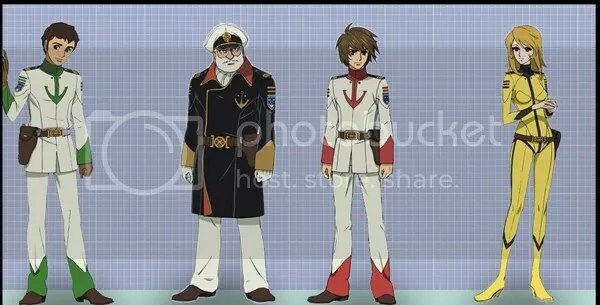 Well, after the first one came out April 7, 2012 it will be my pleasure to put Space Battleship Yamato 2199 Movie 2’s preview as the opening piece of my Summer 2012 anime previews. It is the re-telling of the episodes from the series and a fully-fledged anime film that will probably not be as remembered as the original anime series from the ‘70s of the past century, but it will surely bring a lot of pleasant surprises. The story of the movies, by an old Yamato tradition, is an actual retelling of the respective anime TV series. The second movie which is to come out this June 30 will show us what has happened in episodes 3, 4, 5 and 6 from the currently airing series. Everything revolves around the battle of survival between the human race and the Gamilon, a battle that has lasted quite long and maybe even too long for the planet Earth has already shown a lot of changes for the worst. The very atmosphere of the humans’ old home is already made impossible to live within since the numerous radioactive asteroids have managed to fill up air itself with radiation. Out of good will, or maybe not only, Queen Starsha from Iscander gives the human a special mechanism that can neutralize these harmful effects. The main problem is that the current Yamato ship is more than 100,000 light years away from its aim and it needs to make a double trip within a year for the human race to have a chance of survival. One of the probably most famous aspects of the Yamato series and productions are the mecha designs. In this reproduction of the original series, we get to see four of the biggest names working on the project: Kimitoshi Yamane (Cowboy Bebop, Mobile Suit Gundam SEED), Makoto Kobayashi (Steamboy, Mobile Suit Gundam ZZ/Zeta), Yasushi Ishizu (Mobile Suit Gundam 0080/83), Yutaka Izubuchi (Mobile Suit Gundam Wing, Petlabor). There is no wonder that, even though not many of the episodes have been released, the mechanical designs of the new project are already pretty famous. Here is one of the not-as-famous ships of the franchise. More of them can be seen here . Yamane, Kobayashi and Izubuchi are geniuses. That’s all I’d say. Alriiight! I can’t wait for the next OVA. Honestly, I believe the characters are a bit too “pimped” and softened in design. The machines, however, look promising.